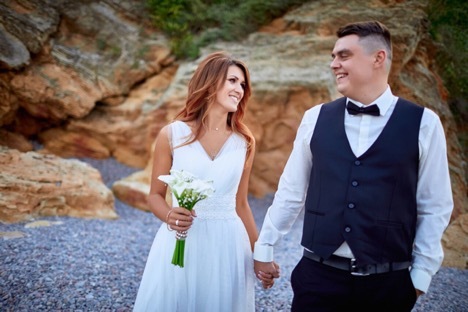 Viktor and Alina are a beautiful couple from a sunny city Odessa based on the South of Ukraine. They were dating and living together ten years before he proposed to her. Viktor threw a ring in a glass of champagne on New Year’s Eve, and of course, Alina said yes! He is an employee of customs, and she is a manager in an alcohol company. 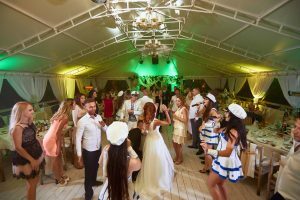 Keep reading to get to know how beautiful, romantic, and fun their seaside wedding celebration was. 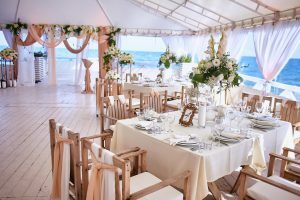 Odessa is a big city on the seashore, therefore the choice of wedding location was quite obvious, it was a beach. 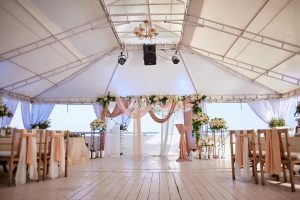 Their wedding took place on a covered pier that goes right into the sea. 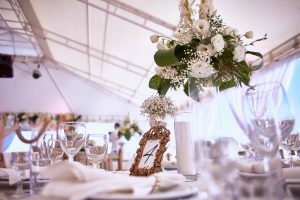 The table was decorated with candles, flowers, and green and beige ribbons. The guests get a glass of ice-cold champagne on the at the entrance to the buffet table. 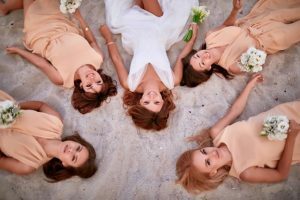 The bridesmaids were dressed in delicate pink pastel dresses. 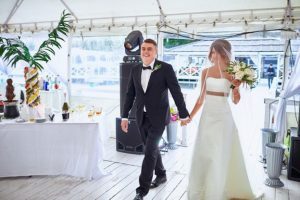 The bride chose a dress in a famous Ukrainian wedding store Corset Wed. She was wearing a chic ivory wedding dress with a ribbon under the breast. On her head, she had a neat braid with flower hairpins and a veil. When it comes to the groom, he decided to stay stylish yet classy, and he chose an elegant black suit with a bow tie. 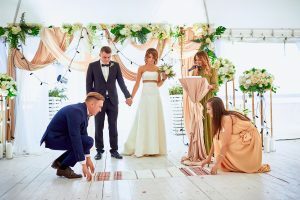 Following the Ukrainian tradition, a towel called ‘rushnyk’ was spread on the floor. After the ceremony, it was necessary to set foot on this ‘rushnyk’. A person who will be the first to set foot on this towel would be the main one in the family. Of course, Viktor did it! 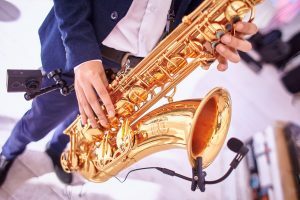 After that, the newlyweds shared their first dance to the saxophonist’s play. They danced to the song of a famous Ukrainian band ‘Ocean Elzy’ which brought to tears almost everyone at the cafe. Later there were showed a touching video dedicated to parents on the big projector screen. It brought almost every guest to tears. 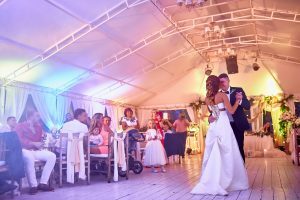 Viktor and Alina organised one more fabulous night ceremony on the beach. “We wanted to say our vows and words of love. 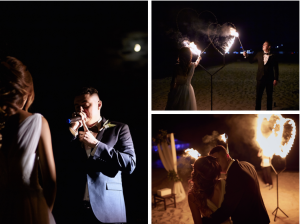 The night ceremony on the beach seemed us a romantic and intimate idea. Our vows were written on paper. After the ceremony, we hid them in a casket. We are going to open them on the first anniversary of the wedding.” – says the bride. There was a beautiful arch developing in the winding cloth on the beach. The bride walked to the groom barefoot on the sand. Newlyweds said their vows to each other. And in the end, they set on fire two huge hearts using torches. They glowed in the dark, windy beach for a long time as a symbol of their eternal love. 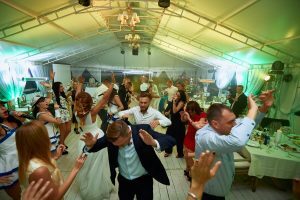 To make the guests dance, a cool dance band broke into the party. The band was wearing dressing gowns, and during the dance, they changed the clothes to the sailor’s costumes. It was a funny thing for residents of Odessa which probably will not understand all the other people. In fact, Odessa is a port city is considered as a place of sailors and their wives. The perfect wedding day ended with a wedding cake. 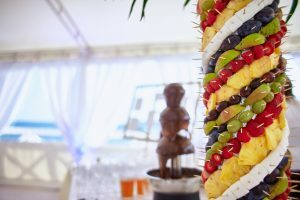 It was a three-tiered cake filled with a blackcurrant mousse and soft biscuits. Such a sweet affair, we think! 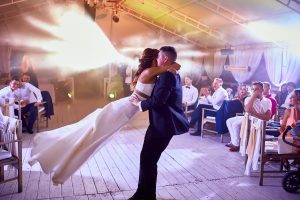 Read more of WedElf’s Real Wedding features and feel the love! Previous PostPrevious He Proposed, You Said Yes!